This is your first album without guitarist John Frusciante in a long time. What feels different and what feels better? Oh, it's all different, obviously. Let me just say that we love John Frusciante and we're so grateful to what he has given us in this band. He's written some of the best parts of our biggest songs and he's just a great, great musician. Probably one of the best musicians I've ever played with. We're all very grateful for what he gave to the band. But, you know, he just wanted to move on. He wanted to do his own thing. And there's no animosity. It's all good. So having Josh Klinghoffer come in, someone that we knew that was already in the family so to speak -- which is such an important part of being in our group because this really is like a family -- to give his heart and open himself up to us, and us being able to embrace him ... He's such a great musician. He's so well rounded. He plays many instruments and writes great. We're just so lucky to find someone right in our backyard. It has to be different. And that's something that helped us grow and change, having the voice that he brings with his musicality to our group. He changed our sound a lot. But also, everybody else changed, too. And that's just keeping things fresh. That's a real positive thing for us because as artists we always want to change and grow and Josh really helped us do that. 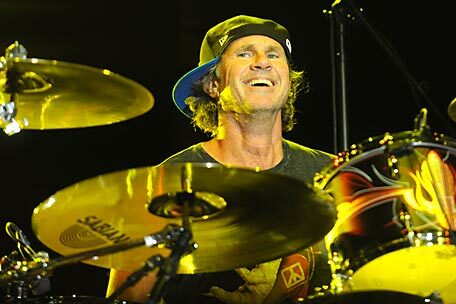 Read the entire post on Spinner - Chad Smith gives interview about I'm with you.